Darwin and Huxley first predicted that we humans shared a common ancestor with the African great apes and it is now abundantly clear that Africa was the “cradle of humanity,” with multiple waves of hominins arising on that continent and spreading across the old world, eventually being effectively displaced by our own species, which also arose in Africa. As Svante Paabo put it, “we are all Africans, either living in Africa or in recent exile from Africa." Given these facts, it is not surprising that the strong emphasis of anthropogeny is on the continent of Africa with studies ranging from genetic to paleontological to archeological to primatological to climatological to sociocultural. 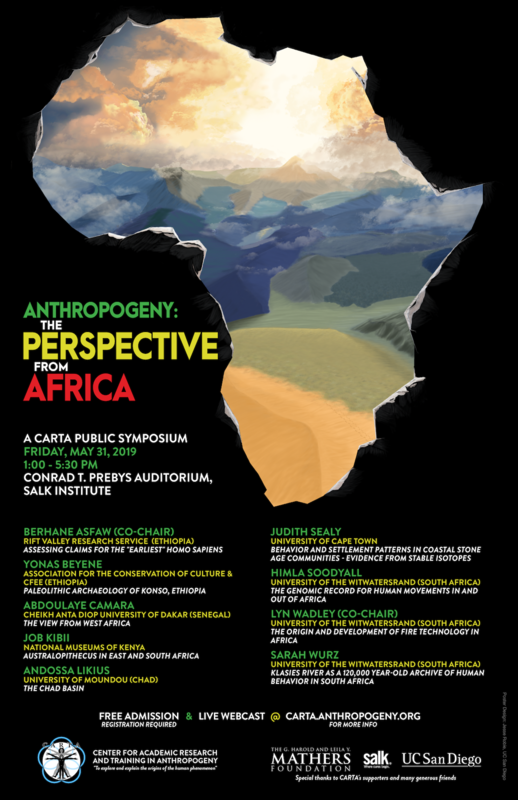 This CARTA symposium focuses on the contributions of scientists and scholars of anthropogeny who live and work in Africa. Talk summaries written by graduate students enrolled in the Anthropogeny Specialization Track can be viewed by clicking on the image in the "Student Summary" column, or by clicking on the individual talk titles below. You must Login or Create an Account in order to register for events on this site. If you have any questions about this event, feel free to send e-mail to carta-info@anthropogeny.org.